Complete Step by Step Instruction. Training bonsai is not as hard as most people think and this beginners course is a step by step program for creating beautiful Japanese bonsai trees from common household plants. Learn pruning, styling and wiring techniques that will transform a regular tree into an amazing living artwork and allow you to make a bonsai tree from almost any plant material! Follow easy to understand instructions that explain how to choose the best material for a beginner to work with, and which trees you can easily train as bonsai. Learn to wire and shape your tree, how to choose and prepare the right pot, and the all important after care and how to keep you tree alive! Start your own Japanese style collection and transform your home or yard into a tranquil Japanese oasis! 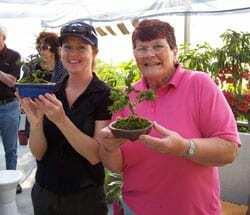 If you have ever wanted to grow your very own bonsai tree, then here is your chance to learn all you need to get started right a way! You can now stop wishing you new what to do, and start creating your own living art! Never Kill Another Bonsai Again! It Doesn’t Have to Take Years! Growing quality trees can take years to achieve, but with the steps outlined in this book you will be able to fast track the process and instantly create a bonsai of your own. This powerful resource has links to other great articles and a direct email set up purely as a support line to make sure you get the most updated information available! Attending a bonsai beginners course can cost you from $60 to $150. 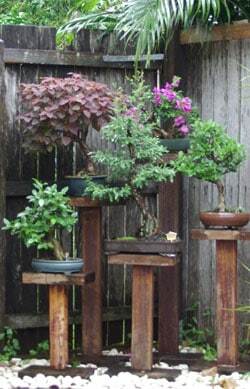 Download your book and get started creating stunning bonsai trees today! 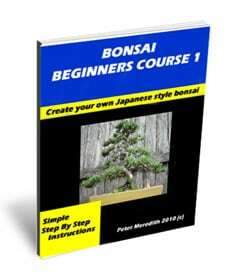 YES, I want to order Bonsai Beginners Course 1 today and discover how I can enjoy the benefits of bonsai without worrying about if I’ll do something wrong – this easy to read guide will show me exactly what I need to do! Simply click the button below to be taken to our secure payment processor, and you will be transferred to the download page immediately following your payment. 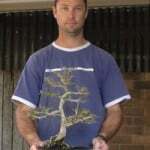 I hope creating your own bonsai will bring you as much pleasure and sense of achievement as it has to me over the years! If you have any questions regarding my book. Pingback: Bonsai, choosing the best tree for a beginner.